Kicking off with a shot of some Asian tattoos and some classic wailing 80’s guitar, it sets the scene for what we’re about to see. There are a lot of ethnic tensions at work in Chinatown, and some classic racism along the way. One of the best things about this movie is Billy Drago as Scalia (although wouldn’t it be weird to see Jack Scalia as Ivan Drago? )...anyway, he puts in a strange and menacing performance. Since he almost exclusively plays bad guys, he’s probably always thinking about how he can put some kind of twist on it. Here he speaks quietly and has many strange mannerisms. He’s definitely a highlight. 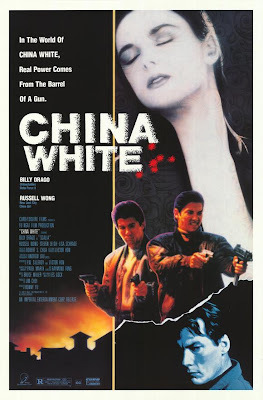 While China White is a gangster drama, it features some very impressive stunts in the mix. There’s one especially great action scene, but there are a few others as well. Once the action moves to “The Golden Triangle”, the pace slacks considerably, and you realize this movie is too long. Other things that stand out are Ricky Ho as Kong, and his amazing wardrobe. The “nothing stereotypical going on here” character of Rasta, and Scalia’s bodyguard Saskia (Van Rijswijk) are also memorable. Saskia makes Brigitte Nielsen look like a wimp. There could easily be a movie where Van Rijswijk plays the starring role. More Saskia would have been a good thing for China White. A great moment in the dialogue department comes when Danny tells Anne all his heroes are American. When she assumes he’s talking about John Wayne and Ronald Reagan, he retorts, “H.Ross Perot”! First of all, it’s great that Perot finally gets a mention in an foreign 80’s violent gangster movie. Secondly, he used his proper name, utilizing the “H”. Has Perot himself ever seen this movie? That was a great moment. Too bad there weren’t more of them. While China White should have been shorter, with the brighter elements turned up like you would the “brightness” on a TV, it would still make an interesting double feature with Amsterdamned (1988). Just be sure to watch China White first. This is one that occasionally shows on Turner Classic Movies, classic indeed! It's definitely a fun movie. Drago stole it. Nice! Looking forward to your take on it.